Stampin' Up! is about to release their new 2012-13 catalogue and I just found out the Butterfly Punch and matching stamp sets are retiring. Even though I no longer sell Stampin' Up!, I do love and use their products, and am sad to see the butterfly leave. I haven't used my SU! 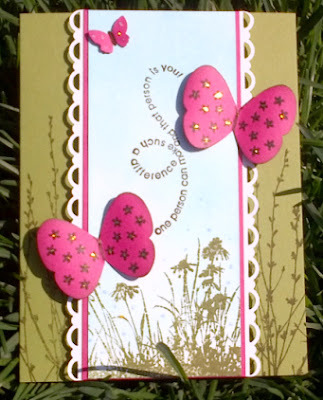 butterfly 'stuff' lately, so today I dug it all out and made a Flight of the Butterfly Punch and stamp set card. I used my new wildflower stamp set from Hero Arts for the background and stamped it in Old Olive on matching paper. Butterflies are Melon Mambo. It is such a beautiful sunny day out that I photographed the card outside in the backyard. 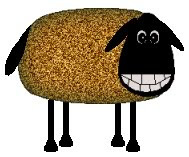 My neighbour, who was cutting the grass looked a little bewildered at what I was doing, but they all know I am a little odd! Now I am anxiously awaiting my new catalogue! When it arrives I am going to make a cup of tea, not peaking, go sit in my lounge chair, oogle over every page and write a big wish list!